There is something literally refreshing in hearing that a product that has been drunk for centuries is now acknowledged as a 'Superfood'. The product is a low gravity (or occasionally non alcoholic) product that is said to hold 'probiotic' qualities namely - Kvass. Less familiar in Western Culture Kvass has its roots in Eastern Europe and in particular the Ukraine and Russia, although it is also consumed in Poland, Latvia and Lithuania. In Russia it is still proudly sold in barrels by street vendors! Its origins go back to at least the middle ages , and akin with other cultures, one of the earliest fermented products. It was invented by the Slavs and is particularly associated with Eastern Slavic inhabitants, hence its close association with Ukraine, Russia and Belarus. Although the character of the product may have changed over the centuries one element of its ancient production was constant, the use of barley, rye or wheat, naturally fermented. As with Egyptian culture it may have been a happy accident that fermenting raw materials normally associated with bread manufacture produced an alcoholic by product. The modern day equivalent will have either black or brown rye as the defining constituent of the blend and flavouring with berries or fruit is common. Unlike beer no hops are used in its manufacture. It is being hailed as a Superfood as it is said to contain many anti-cancer fighting elements, along with being an immune enhancer, liver cleanser, and fights free radicals. Finding the product in the UK may be just that little harder although ethnic or Eastern European retailers would be the best outlets. The best brands (ironically) are said to be produced by the commercial brewers, but there are many brands made by soft drink manufacturers also who rarely use traditional raw materials. 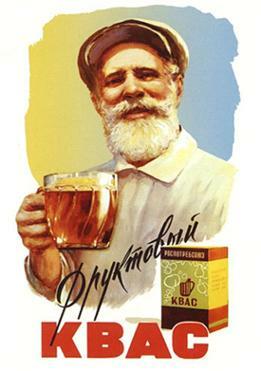 So when looking out for Kvass see if it is associated with other beer products in the range of the producer, that way you can be sure it will be the genuine article.